As exchange-traded products grow in popularity, some believe they will one day dominate mutual funds. Exchange-traded products, or ETPs, are one of the fastest growing components of the investment landscape. Future growth in ETPs is predicated on several factors including the continued adoption by advisors, institutions and individual investors. As ETPs grow in popularity, some believe they will one day dominate mutual funds. In this article, we’ll examine the growth of ETPs in comparison with mutual funds and look at the market share of each over the last 18 years. Will ETPs hold more assets than mutual funds one day? Hopefully, this will provide the proper context for such a claim. Author’s Note: It should be noted that I will use the acronym ETP when referring to ETFs. ETP is more comprehensive as it includes all legal structures (i.e. open-end, partnership, UIT, etc.). For more information on the legal structure of ETPs, see my previous article in this series on ThinkAdvisor. Beginning with the 1993 launch of the first ETP, State Street Global’s SPDR S&P 500 ETF (SPY), these investments have experienced significant growth. 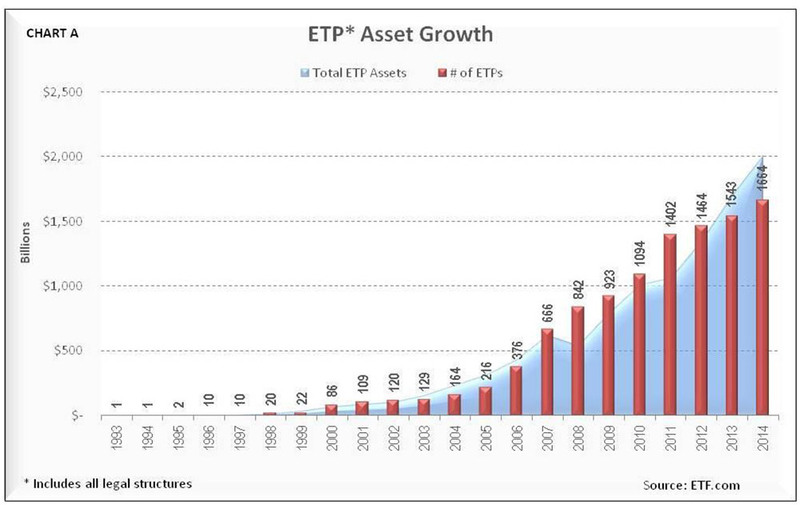 Moreover, ETP assets have risen every year but two: 1994 and 2008. In 1994, we experienced a mild stock decline and 2008 was the year of the financial market meltdown. It’s interesting to note that ETP assets grew throughout the tech bubble of 2000 and subsequent bust. The number of ETPs has been rising since their inception. Today, there are a little over 1,660 ETPs, according to ETF.com. The following chart (CHART A) contains the growth of ETP assets (in billions) and the number of funds each year since inception. A quick glance will reveal that the major growth spurt began around the year 2000 as the tech bubble burst. As of December 31, 2014, total ETP assets were slightly over $2 trillion. Despite such significant growth, ETP assets trail mutual funds by a wide margin. According to the Investment Company Institute, mutual funds have almost $16 trillion in assets. This represents a market share of about 88.8%. Despite the significant gap, some believe ETPs will dominate mutual funds in the not-too-distant future. Dave Nadig, chief investment officer with ETF.com has written that “assets in ETFs will cross the assets in mutual funds within 10 years.” Perhaps that’s a bit aggressive, but it may not be that unrealistic. Before exploring this issue in greater detail, let’s examine the growth in mutual funds over the past 18 years. Because mutual funds have a much longer history than ETPs, comparing them with ETPs is a bit like comparing apples and oranges. After all, it’s easier to double a dollar than it is to double $100 million. Whereas mutual funds constitute a more mature industry, ETPs are still relatively new. In addition, when Congress amended the Internal Revenue Code in the 1970s that made IRAs and 401(k)s possible, it sparked a resurgence in mutual fund investing. In short, the mutual fund industry had a running head start before ETPs were created. 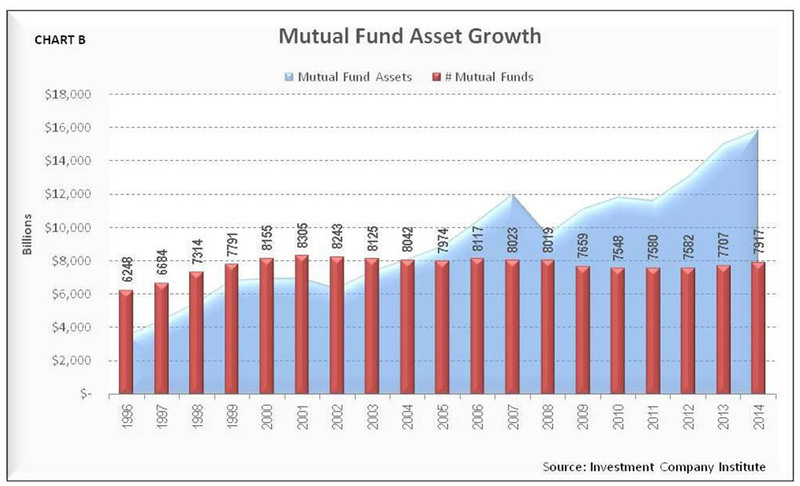 Chart B illustrates the growth in mutual fund assets since 1996. For perspective, that was only three years after the first ETP (SPY) and 72 years after the first open-end mutual fund ( MITTX) was created in 1924. Thus far we’ve discussed the total assets and number of funds each year for each investment type. Now we’ll see how the average amount of assets per fund and market share have changed since 1996. Chart C displays the average assets per fund. It is based on the total number of funds divided by total assets at the end of each year. ETPs had a noticeable spike in average assets per fund in 1999 and from 2003-2005. 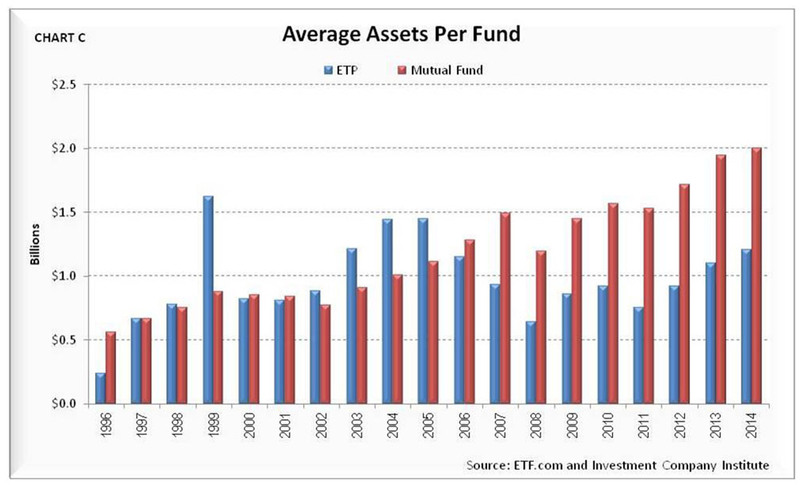 However, beginning in 2007, mutual funds have had a much higher average asset per fund than ETPs. 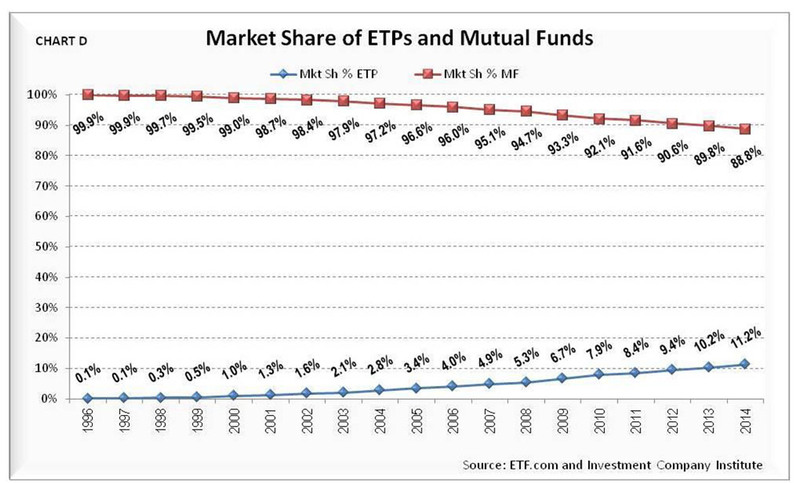 In Chart D below, we can see the market share of mutual funds and ETPs from 1996 through the end of 2014. As ETPs become increasingly popular, the market share of open-end mutual funds continues to fall. In fact, mutual funds have lost market share in every year since 1996. Will ETPs overtake mutual funds within 10 years? Based on the current trend, it doesn’t appear likely. This seems even more unlikely when you factor in company retirement plans because defined contribution plans rarely offer ETPs to plan participants. Therefore, to the extent that these plans continue to favor mutual funds, ETPs will have a more difficult time achieving asset dominance. Slowly but surely, ETPs continue to grow in popularity and capture market share. As investors become increasingly comfortable with this investment vehicle, the trend should continue and may even accelerate. In my opinion, advisors are transitioning away from mutual funds toward ETPs. If this were to increase substantially, the 10-year prediction may materialize. In any event, I believe the ultimate question is not whether ETPs will overtake mutual funds but rather when?